Robotic revolution in the coming years is seen as an increasingly popular concern, as robots are expected to take over human jobs leaving them broke and unemployed. 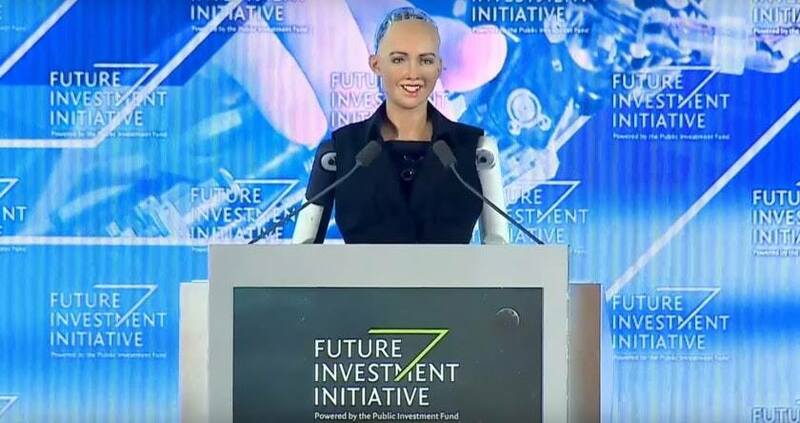 If this was not scary enough, Saudi Arabia on Wednesday went on to become the first nation in the world to grant citizenship to a female robot at the Future Investment Initiative (FII) conference summit held in the kingdom’s capital city of Riyadh. Created by founder of Hanson Robotics, Dr. David Hanson, Sophia is an artificial intelligence robot designed to look like Audrey Hepburn, can respond to questions and whose purpose is to help in elderly care facilities and assist visitors to parks and events. The announcement of citizenship was made by Andrew Ross Sorkin, the panel moderator who is co-anchor of CNBC’s Squawk Box and founder and editor at large of Dealbook at the New York Times. “Thank you to the kingdom of Saudi Arabia,” Sophia told the panel at the summit after the announcement was made. Sophia revealed her “expressive face” to the audience that showed her angry and sad face. While Sorkin admired the robot’s ambitions, he said that “we all want to prevent a bad future,” where robots turn against humans and could take over them. For those unaware, Saudi Arabia has been making huge investments in technology through Japan’s SoftBank Group private equity firm. SoftBank had released Pepper, a humanoid robot as a prototype in 2014 and as a consumer model a year later selling 1,000 of them in less than a minute. To boost robotic technology, Saudi Arabia on Tuesday also announced plans to build a $500 billion mega city, NEOM, which will be powered by robotics and renewables on the country’s Red Sea coast.